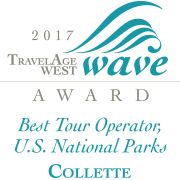 Collette’s guided travel has many unique benefits. Not only do we make sure you don’t miss a single epic sight, but we make plans for you to interact with the people who live there, savour the food, enjoy hand-selected accommodations and get the freedom to choose between different possibilities for adventure that are included with the price of your tour. All you have to do is put on your walking shoes and get your camera ready. We will handle the rest. The way to a traveller’s heart is through the taste buds! Tasting local delicacies is a great way to get to know and appreciate a new culture. Be adventurous and try the foods and flavours that sustain life in that corner of the world. They may even teach you how to make it at home. We’ve been travelling with people for a long time and if there’s one thing we know for certain, it’s that no two people are exactly alike. Everyone has their own interests and preferences, so that’s why we have created itineraries with choices built in so that you can create your own adventures. All of these choices are included with the price of your tour. Yep. You read that right.